Why am I receiving “Automatic update is unavailable for this plugin.” notice? This notice is being displayed because the item’s support license key has not been activated. Please see the FAQ on how to activate your support license key. Why am I receiving “Oops! Something went wrong.” error? 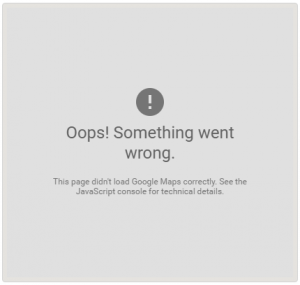 If you are receiving the error message instead of a Google Map then you need to set your Google Maps API Browser and Server keys. To learn how, please refer to the Get Google Maps API Keys tutorial. Why am I receiving “Update package not available.” error? You are receiving this error because the support license key is either not activated or has expired for the item being updated. If you have not yet activated your support license keys, please do so following these instructions, then update the premium templates or add-on extension. If your support license key has expired, please see this FAQ on how to renew your support license key. Why am I receiving “Download failed. Unauthorized” error? If you see this error when attempting to update an extension or template it means the support license key is invalid or has expired. You will not be able to receive updates. Purchase a valid support license key for the extension or template you are attempting to update. 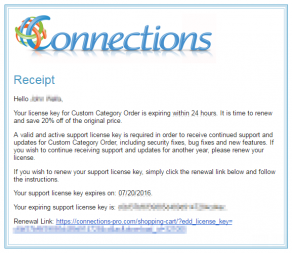 Renew your support license key for the extension or template at a discount. If you do not know if your support license key is expired or not, you can find out on your Purchase History page under the Licenses tab. Why am I receiving “Update Failed: Plugin update failed.” error? This can happen for several reasons outlined below. An update will appear as available, but attempting to update will result in the “Update Failed: Plugin update failed.” error message. In order to update, you will need to renew your Support License Key. In order to receive updates for the extensions or templates you have purchased you must activate the Support License Key on the site for which you wish to receive updates. Please see the FAQ on how to activate your support license key. It is a common practice to develop a new site on a development server and then publish the site on a production server which has a separate domain name. This causes the Support License Key activation to become invalid. It is recommended to only activate your Support License Key on your live production server/site. Navigate to your Purchase History page. Click the Manage Sites link for the item that you need to update your domain. Click the Deactivate Site link to remove the development site. Enter the the full URL of the live site. Deactivate a URL from a Support License Key. Activate a Support License key to a URL. Warning: is_dir() [function.is-dir]: open_basedir restriction in effect. If you receive any of the following errors, they are being caused by the web host’s server configuration for open_basedir. You should contact them in order to fix the configuration. Alternative, you can safely delete these three files. Here are more details about what these three files contains and why they are present. Both of these are added to the folder for the expressed purpose of make the folder not directly accessible to random site visitors for security reasons. So removing them, could provide access to those files within this folder (if there are any at all). The ~README.txt contains instructions on where to move the template files so changes can be made to them in an update safe manner. You do not have sufficient privileges to access this page. Generally this error will only occur because a third party plugin has deleted the custom roles and capabilities that Connections installs and requires. Currently there are two know plugins that can cause this issue. Every time this plugin is updated, it will remove all custom roles and capabilities that are required by other plugins which includes Connections. More can be read about this in this FAQ. Clicking on the “Reset” button in this plugin will also remove remove all custom roles and capabilities that are required by other plugins which includes Connections. This solution to fix this can be found in this FAQ. If you receive this error, the most likely cause is that the the web host is automatically deleting this file because it contains a function that is able to recursively delete files and folders. This function is used to delete all the images associated to an entry and its containing folder when an entry is deleted. Currently the only known host, at the time of the writing of this FAQ, to helpfully delete this file is Dreamhost. The solution is to request that they whitelist this file so it does not get deleted. After the file is whitelisted you can reinstall Connections and it will continue to function normally again. The cache folder is not writable. I’m getting a notice that says; “The cache folder is not writable.” What does this notice mean and how do I fix it? This folder is created automatically during the installation Connections as it is part of the default plugin folder structure. The folder is required as it is where temporary intermediate images are created and stored. During activation Connections will attempt to make this folder writable, however, some web host configurations prevent this from occurring automatically. To fix this, log in to your site using FTP and browse to the wp-plugins folder and locate the connections folder. Now, set the permissions of the cache folder to be writable by setting the permissions to 755. NOTE: Some web host configurations require additional privileges, if that is the case, try 767. NOTE: You might have to first delete the folder, recreate it and then set the permissions. The cache folder does not exist. I’m getting a notice that says; “The cache folder does not exist.” What does this notice mean and how do I fix it? This folder is created when Connections is installed as it is part of the default plugin folder structure; you should not receive this notice unless the installation was not properly completed. If you receive this notice, the first thing to try is to deactivate, delete, reinstall and reactivate Connections. If that does not work and you continue to receive this notice, you will have to create the folder manually. To do this, log in to your site using FTP and browse to the wp-plugins folder and locate the connections folder. Now, create the cache folder within the connections folder. Lastly, this folder needs to be writable; set the permissions to 755. The connections_templates folder is not writable. I’m getting a notice that says; “The connections_templates folder is not writable.” What does this notice mean and how do I fix it? This folder is created automatically during the installation and activation of Connections. The folder is required as it is where custom legacy templates are uploaded. During activation Connections will attempt to make this folder writable, however, some web host configurations prevent this from occurring automatically. To fix this, log in to your site using FTP and browse to the connections_templates within the wp-content folder. Now, set the permissions to 755. The connections_templates folder does not exist. I’m getting a notice that says; “The connections_templates folder does not exist.” What does this notice mean and how do I fix it? This folder is created when Connections is installed and activated, however, some web host configurations prevent this from occurring automatically. If you receive this notice, the first thing to try is deactivating and reactivating Connections. If that does not work and you continue to receive this notice, you will have to create the folder manually. To do this, log in to your site using FTP and browse to the wp-content folder. Now, create the connections_templates folder within the wp-content folder. Lastly, this folder needs to be writable; set the permissions to 755. The connections-images folder is not writable. I’m getting a notice that says; “The connections-images folder is not writable.” What does this notice mean and how do I fix it? The connections-images folder does not exist. I’m getting a notice that says; “The connections-images folder does not exist.” What does this notice mean and how do I fix it? I get the following error, what does it mean? Why do I get a 404 error when clicking on an entry’s web address? Edit the address to include: http:// at the beginning of the web address. Fatal error on activation, what does this mean? How do I activate my support license key? In order to receive updates for the extensions or templates you have purchased you must activate the Support License Key on the site you wish to receive updates. In the sales confirmation email. On your Purchase History page, under the Licenses tab. Navigate to the Connections : Settings admin page. Enter your Support License Key. Connections: Settings admin page, Licenses Tab. If you are receiving the “Automatic update is unavailable for this plugin.” notice when trying to update, first activate your support license key, then visit the WordPress Updates admin page and click the “Check Again” button. Doing this will reset the notice and allow you to update the item you have just activated. Where do I find my support license keys? How do I renew an existing support license key? There are several ways you can quickly and easily renew your existing support license key. Clicking the renewal link in the support license key expiration notification email. Clicking the “Renew license” link for the item you wish to renew on your Purchase History page under the Licenses tab. Add the item you wish to renew to the shopping cart and then enter your support license key for the item on the checkout page before submitting the purchase. You will receive several email notifications sent to the email address you used when you made the original purchase prior the the expiration of a support license key. This email will contain a link to the checkout page with the item to be renewed added to the cart and the support license key pre-filled for renewal so that you can quickly and easily complete the purchase to renew the support license key. The renewal discount will also be applied, if applicable. If you did not receive the expiration email notifications or you no longer have them you can renew from your Purchase History by clicking the “Licenses” tab and then “Renew license” link for the item you wish to renew. Clicking this link will take you to the checkout page with the item to be renewed added to the cart and the support license key pre-filled for renewal so that you can quickly and easily complete the purchase to renew the support license key. The renewal discount will also be applied, if applicable. Additionally you can add the item that you wish to renew to the cart as if you are making a new purchase. When you checkout, you will have the opportunity to add your support license key by clicking the “Click to renew an existing license” link. When you click the link you will be presented with an input where you can enter your support license key. Learn where you can find your support license keys in this FAQ. After you have entered your support license key, click the “Apply License Renewal” button and the renewal discount, if applicable, will be applied. After you choose an option and click the “Renew” button you will be taken to the cart and the support license keys pre-filled for renewal so that you can quickly and easily complete the purchase to renew the support license keys. The renewal discounts will also be applied, if applicable. Links return a 404 page not found error. Connections generates links which resolve to its internal pages and on servers running Windows Server 2012 R2 / IIS 8.5 some links may resolve to a 404 page not found error. Configuring IIS to allow “double escaping” fixes the issue. In IIS, there’s a GUI setting for this within IIS Manager. One, when copy pasting the shortcode into a page or post while using the rich text editor (the Visual tab) HTML tags will also be pasted. The solution is to paste the shortcode into the HTML editor (the HTML tab) or use the “Paste as Plain Text” button in the Visual editor. To fix this, go to the page or post where you pasted the Connections shortcode, switch to the HTML editor and remove any HTML tags that surround the shortcode, for example <pre></pre> and <code></code>. Two, many commercial themes support shortcodes named [raw] or [noformat]. If your theme does, wrap the Connections shortcode within one of them. Here are examples of how to use the [raw] and [noformat] shortcodes. If the [[raw]] or [norformat] shortcodes do not work, please visit the Support Forum for assistance. A copy of your theme may be required in order to debug the issue. As of version 0.7.6.1 of Connections there is a setting can be enabled that attempts to fix the issue with themes that implement the [[raw]] shortcode. Please go to the Connections : Settings admin page, Advanced tab. Under the Compatibility section, please check the Templates option and click the Save Changes button. Is Connections compatible with WordPress Multisite? Yes, Connections is WordPress Multisite compatible. However, Connections is not compatible with network activation. You should only activate Connections on the subsites in which you intend to use Connections on. If you have activated Connections for the network, you have to disable the network activation. Then go into the multisite settings and check the box for plugin administration. Next go into individual sites you wish to use Connections, you can then choose which non-network activated plugins you want to activate. Connections should show up in this list, activate it. Can Connections be translated into my language? Yes, as of version 0.7.3, the required default.po file is available for translation. Why do dotted underlines show under the dates? Some browsers put a dotted underline or border on each <abbr> tag. The <abbr> tag is needed for hCalendar event compatibility. To remove this from the styling, add the following CSS rule declaration to your theme’s CSS. Where are the images saved? Why don’t all individuals show when I use the list_type option in the shortcode? Older versions of Connections didn’t set this property to an entry. To fix; edit all entries that should appear in the list by selecting the appropriate type and then save the entry. Why don’t any entries show up when I use the shortcode? When adding a new entry you have the option of choosing public, private or unlisted. This setting affects if a listing will be shown when embedded in a page/post. If an entry is public, that entry will shown at all times. If an entry is private, that listing will only be shown when a registered user is logged into your site. By choosing unlisted, that entry will not be shown and is only visible in the admin. NOTE: When using the shortcode an attribute can be set that will allow you to override the private status of an entry. This is useful if you wish to show a single entry or group of entries regardless if it was set to private or not. Which version of PHP does this plug-in require? Connections requires PHP version 5.2.4 or greater. This plugin will “wipe” or “reset” the custom role and capabilities of plugins such as Connections, Easy Digital Downloads and Events Manager add on each update that is released for it. So if you receive the this error “You do not have sufficient privileges to access this page.” and have s2Member installed, here’s how to fix it. Since custom roles in WordPress are persistent so Connections sets a “flag” in the options that if it exists will not attempt to recreate them which would reset them. Once this flag is set, there is no point and click way to force reset the Connections custom roles. Not even deactivating and deleting will reset this “flag”. With that said, there is a solution. // Class used for managing role capabilities. Save and activate the snippet. You should now be able to view all of Connections admin page.
! Important ! Deactivate the snippet. UPDATE 11/11/2015: GMO Font Agent 1.6 fixes the issue. When this plugin is installed activated will break the functioning of the Template Customizer, it will briefly load and then disappear. The only known fix at this time is to deactivate this plugin. This might be a good idea because at the time of writing this FAQ it has been over 2 years since it has been updated and there are many reports of it breaking other plugins and not working correctly in newer versions of WordPress. When this plugin is installed activated with the “File lock” feature enabled, images and logos are no longer displayed. In order to have the images and logos display, you must disable the “File lock” feature. This is caused by a bug within the plugin the incorrectly sets the image mime type for JPEG images. This bug could potentially have negative effects on any other plugins or themes which uses core WordPress functions for image processing. The plugin has not been updated in over 2 years at the time of the writing of this FAQ so it appears this plugin has been abandoned. If you are affected by this plugin conflict and you no longer require the Media Features plugin then the solution is to deactivate it. If you require this plugin and are able to edit PHP you can remove the filter that contains this bug and the plugin should continue to function correctly. Either remove or comment out this line. Save and upload the file overwriting the original. This plugin alters how and when the core WordPress wpautop filter is applied to page and post content. This will negatively affect all plugins that use shortcodes to add content to the page, including Connections. The wpautop filter will be applied to the content from the Connections shortcode will be run thru this filter when it shouldn’t be which causes <p> and <br> HTML tags to be inserted. The extra tags will break the layout of all Connections templates and Form. Formidable Pro ship with an older version of Chosen which breaks Connections use of it. The only solution is to replace the version that ships with Formidable Pro with the newer version that ship with Connections. When Connections is installed and you attempt to update the ‘Screen Options per page limits’ in Formidable Forms, Entries, Templates, or Custom Display pages the limit is set to ‘1’ and you’re unable to update the limit further; it stays ‘stuck’ on 1. There is no known solution. It was reported that there is a conflict between Connections and this plugin. The actual issue is unknown. When this plugin is active, all links added to an entry will open in the same window regardless of the target setting. This can be resolved by unchecking the “Remove target attribute from links” option under the “Miscellaneous Accessibility Settings” section. Install the Code Snippets plugin. Save and Activate the new snippet. Now, both Connections, its template and the Comprehensive Google Map Plugin should play nicely together. The only other option is to use another plugin. A user suggested Leaflet Maps Marker as an alternative to Comprehensive Google Map Plugin. When this plugin is installed and activated it interferes with being able to edit categories. Appends .htm or .html or .php or other extension to the URL of pages which creates invalid permalinks for Connections. This results in the links returning 404 errors. This plugin adds the “.html” to the wrong portion of the permalinks for Connections. This results in the links returning 404 errors. When WP Deals is installed and activated the upload fields for the image and logo fields on the Connections : Add Entry admin page can not be seen. See the screen capture. This plugin re-writes the links created for the Note and Bio tray links on the cMap and Market templates causing them to no longer function. The only fix it to disable this plugin. The plugin seems run the wpautop function or the the_content filter in a way that it is runs on other shortcodes which is opposite of the way WP processes shortcodes by default. The issue this causes is that extra line breaks and paragraph tags are inserted into the template output. This would also negatively affect any shortcode based plugin, but would likely only noticeable on plugins that output significant amounts of HTML. When Fluency Admin is installed and activated the upload fields for the image and logo fields on the Connections : Add Entry admin page can not be seen. See the screen capture. It has been reported that they may be a conflict when JetPack is installed in IE8 only. The page with the Connections directory will only show a smiley face. The smiley face is used for JetPack statistics. Hide the stats smiley face image. Disable that, and all is well. The Google Maps API server rejected your request. The “sensor” parameter specified in the request must be set to either “true” or “false”. UPDATE 2: When performing a search in IE or Chrome, Firefox seems to be unaffected, the results will be shown. However, if you perform a second search from within the previous search results, you will receive a 404 error. At this time there is no solution other than to deactivate Better WP Security. There might be a conflict with this plugin. The only info I was able to get was that when activated with Connections the site broke. I tested both activated with the default 2011 theme and both plugins seems to function correctly. So, it you are having issues, please try deactivating this plugin. Update: I was told they were unable to login to their admin. I was not able to replicate this issue either. NOTE: This FAQ was written based on U Comment Extend 1.1. NOTE: This FAQ was written based on Auto Thickbox Plus .3. UPDATE: Version .6 and newer resolves this conflict. NOTE: This FAQ was written based on Flickr Gallery 1.5.2. NOTE: This FAQ was written based on Strx Magic Floating Sidebar Maker 1.2. If the template you are using has an embedded Google map and only an empty box is showing, the cause might be a conflict with Events Made Easy. This plugin still uses the Google Maps API 2 which is loaded in the head of every page instead of just the pages it is needed on. Connections uses Google Maps API 3 which is only loaded on the page foot where it is being used. This error prevents the images from displaying. They appear to be stuck “thinking”. This is completely untested, so try at your own risk. NOTE: this FAQ was written based on BP GTM System 1.0.1. This plugin named simply Contact Form shows up as BWS Contact Form in the WordPress admin. It sets the menu position manually which overwrites the Connections admin menu if it is in the first position in the plugin section after the WordPress Setting menu. So if you install this plugin or have it installed and you do not see the Connections admin menus, please deactivate this plugin. There is a jQuery version conflict between Connections and cForms II. 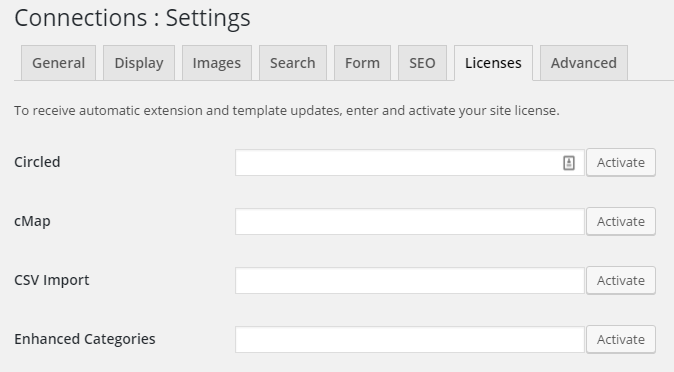 To resolve this conflict, go to the cForms Global Settings page in your WordPress admin and put the post IDs that you are using cForms on in “Include cForms header data only on specific pages” and save the settings. You do not need to use PayPal or more specifically, you do not need a PayPal account in order to make a purchase. Use the “Don’t have a PayPal account?” option. This will allow you to pay by credit card without having to need or use a PayPal account. PayPal will just act as the payment processor, no differently than if you would use the card at your local store. I get a browser error when I try to make a purchase. How can I fix it? Please try clearing your browser cookies or try to make the purchase using a private browsing window. This error seems to be caused by a corrupt cookie set by PayPal. Scroll to the bottom or click the green Post New Reply button. Type your reply and then click the blue Submit button. If you have purchased an item, you should first login using the name and password you used during the checkout process. Scroll to the bottom or click the green Post New Support Topic button. Type your question and then click the blue Submit button. You do not need to register to post a support question in the support forum. Templates and extensions for the Connections WordPress plugin are licensed under the GNU General Public License. The templates and extensions for the Connections WordPress plugin sold at connections-pro.com are permitted to be installed on an unlimited number of WordPress installations, however, support as defined here is only offered on a single WordPress installation where the support license key has been activated, unless a multiple site support license key has been purchased. The terms of a support license key are defined here. 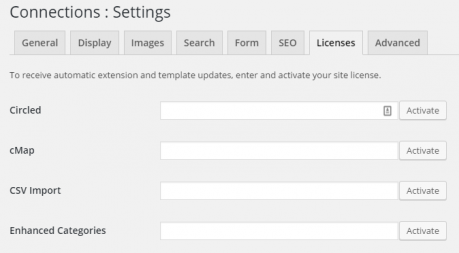 All representative agents of the Connections WordPress plugin retain the right, at any time, to modify or discontinue, temporarily or permanently, a support license key with or without notice. Support is available via support forums only; phone and email support are not offered. Access to the support forums is restricted to an individual and / or a representative agent of an organization that has purchased a template support license key or extension support license key for the Connections WordPress plugin. Access to the support forums is granted for for a period of one year starting at the date of the last purchase of a template support license key or extension support license key for the Connections WordPress plugin from connections-pro.com. Support is limited to the Connections WordPress plugin and to the templates and extensions for the WordPress plugin Connections sold at connections-pro.com. Support for third party WordPress themes and / or WordPress plugins is not provided. In the event that there is a conflict with one more third party WordPress plugins or WordPress themes and it is determined that the source of the conflict is one or more third party WordPress plugins and / or WordPress themes it is up to the discretion of the Connections Help Desk representative agent to determine if a resolution can be provided or if support will have to be deferred to the individual and / representative agent of the third party WordPress plugin and /or WordPress theme. A support license key can only be activated on a single site unless a multiple site support license key has been purchased. If a multiple site support license key has been purchased, support and updates will be granted to each site in which there is a valid support license key activated. Support license keys are valid for a period of one year from the date of purchase. A support license activation will not count against the activation limit when activated on a site which contains the following in a URL. This is to allow you to activate your support license key on a development or staging site. 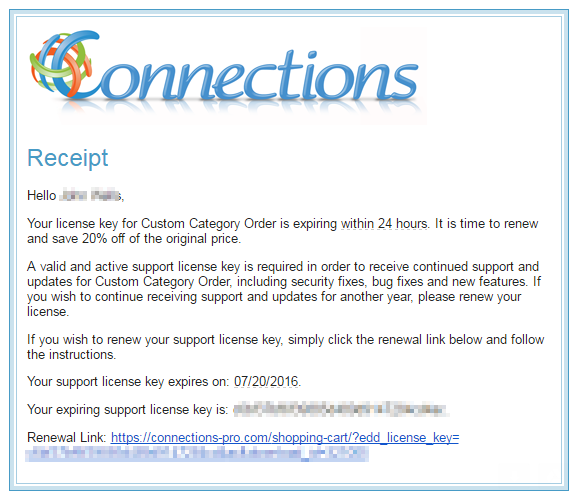 A support license key can be renewed at a discounted rate. You will be notified via an email, sent to the email address supplied at the time of purchase, of an expiring support license key one month before the support license key expires. By completing a purchase of any of the templates and / or extensions you agree to the this support license and you agree to receive, via email, the support license key renewal notice. The renewal fee would be the current price of the item at the date of renewal minus 20%. As an example if you were renewing it today, the fee would be $15.99 instead of $19.99. All representative agents of the Connections WordPress plugin retain the right, at any time, to modify, temporarily or permanently, the price of any of the templates, extensions and bundles for the Connections WordPress plugin. The templates and extensions for the Connections WordPress Plugin are intangible downloadable goods and as such refunds are not issued after the purchase has been completed. However, a refund may be considered within the first 14 days of the of the initial purchase if the template or extension fails to perform according to its designed function when installed on a clean installation of WordPress using its default theme with no other installed or active plugins and you have worked with help desk support in order to resolve the issue. The refund will then be granted at the sole discretion of help desk support. No refunds will be considered or issued after 14 days of the initial purchase. In the event that a refund request is granted, the request will take 7 to 10 business days to be processed not including the time required by financial institutions to transfer the refund. The refund will be equal to the amount of the item(s) purchased minus any taxes and / or transaction fees as applicable. The request is made within the first 14 days after the completed purchase. The template or extension is not performing to its designed function and you have submitted a support ticket in the Support Forums and help desk support was unable to resolve the issue(s). The request is made after the first 14 days after the completed purchase. You decide not to use the purchased templates or extension. By completing a purchase of any of the templates and / or extensions you agree to this Refund Policy. All template and extensions for the Connections WordPress plugin sold at connections-pro.com are sold as is without warranty of any kind, expressed or implied. No individual or representative agent of the Connections WordPress plugin is liable for any damages, including but not limited to, direct or indirect, incidental or consequential damages or losses that occur as a result of the installation and / or activation of any of the templates and extensions for the Connections WordPress plugin sold at connections-pro.com. This FAQ may apply to all Themify themes but has only been confirmed with their Magazine theme. The theme has a visual page builder built in. This is a great feature to have. This particular visual page builder caches its output which is normally is a good thing. However, this simply will not work for highly dynamic shortcode based plugins like Connections. The output of the Connections shortcode changes based on actions the user takes. Since the page builder caches the output, the only output from Connections that you will see is what was displayed when the page was first visited. This means that clicking links and performing search will appear not to work because the same content from the page builder cache will be displayed. This page builder cache feature seems to have been introduced in version 2.4.2 of their theme framework. This can be fixed by disabling the page builder cache. Go to Themify > Settings > Themify Builder and disable the Builder cache. NOTE: This FAQ was written based on Magazine 1.5.2 by Themify. Very, very, bad.. the global variable $wp_query should never be altered, things will break in very unexpected ways. Those lines can be commented out (removed) and theme and Connections work together. However there still may be another bug with theme. I’ll try to explain. The theme is nullin’ing out that global variable because they are resetting it to run a new query. First, does not need to be, second, the theme is overwriting it which should not be done because that original copy is gone and cannot be restored if needed. Just like it is shown in the WordPress Codex. NOTE: This FAQ was written based on StereoClub 1.0.4. Both Connections and the Stack theme both utilize a script called picturefill in order to add support for responsive images to browsers which do not yet support the new HTML img tag markup standard for responsive images. The conflict occurs because both Connections and Stack both register the library with the same “handle” with WordPress. Only a single script can be registered per “handle”. This causes the script to only be loaded once which is by design and usually a good thing. In this case, only the version loaded with Connections is loaded. Generally this is not an issue either, but in this case the theme uses a much older version of the picturefill script which required the HTML markup for images to be done in a non-standard way. This has been corrected in newer versions of picturefill, which is what Connections uses. Since the version that is being loaded by Connections is newer and no longer compatible with the older non standard image markup, many of the images loaded by the theme will no longer load. Add a new snippet with the following code. What this snippet will do is load the picturefill script that comes with the theme with a different “handle” so both the version with Connections and Stack are loaded. This will not cause a compatibility issue because of the difference in HTML img markup that is required for each version of picturefill. NOTE: This FAQ was written based on Stack 1.0. This theme alters how and when the core WordPress wpautop filter is applied to page and post content. This will negatively affect all plugins that use shortcodes to add content to the page, including Connections. The wpautop filter will be applied to the content from the Connections shortcode will be run thru this filter when it shouldn’t be which causes <p> and <br> HTML tags to be inserted. The extra tags will break the layout of all Connections templates and Form. The only solution is to attempt to use CSS to minimize the effect these extra tags will have on the display of the templates and Form. NOTE: This FAQ was written based on RealtorPress 7.1.3 by PremiumPress. This change keeps the theme from adding the filter that removes the query string. This theme changes the order in which WordPress’s wpautop filter is run. Changing this will negatively affect any plugin that displays content on a page or post such as Connections. A simple, and safe, option is to disable this code in the theme. Both Connections and the Mysitemyway inFocus theme both use a jQuery image preloader function but they function completely differently and so they are incompatible. Save the file and overwrite the one on the server. // Include footer design file. Now, Connections should work fine without negatively effecting the theme. The only real change is altering where the wp_footer() action is run. Please note this FAQ was written based on Mingle 1.5.1, this solution may or may not with with other versions. Can I translate Connections in to my language? Yes, to get started and learn how, please see this page. Where are the PO files? The PO files are no longer included with Connections, only the required MO files are included. Transifex is used to manage translations as it provides an easy to use centralized platform to manage translations as well as providing translators with an easy to use interface for creating and updating translations. If you’d like to translate Connections, see this page on how to get started. Where should I save my MO and PO files? If you do not have a languages folder in the wp-content folder; first create it and then create the connections folder within it. NOTE: Spelling and capitalization are very important. If your translation is not being loaded, please double check the folder names. NOTE: In order for the translation to be loaded the WPLANG constant must be set to the correct local in the wp-config.php file. How can I update a translation? The steps to updating a translation is very similar to creating a new translation. Go here and create a free account. After you create a free account, send me your username and which language you wish to update. Alternatively, you can request to join a translation team from right within Transifex on the Connections Project page by clicking the language you wish to update and then click the Join Team button. If you send me your username, I will add you to the translation team for the language. Go to to this page. Click the link of the language you wish to translate. Click the POT File link. This will bring up a pop-up window. Click the Translate now button. You will now be in the translation editing screen. On the left is every string in Connections that can be translated. Click on the strings you want to translate and / or update. Enter your translation where it says, “Type your translation here”. At any point you can stop and any strings you have translated will be saved. Click the Dashboard link at the top right to go back to the main project page. If you would like to use your updated translation right away rather than waiting for an update to Connections to be released, please see this FAQ. How do I increase the PHP Execution Limit? You can adjust the PHP execution on your own, here are some methods to try. I recommend starting at the top an working your way down the list. Apply only one change at a time, do not try to apply them all. Be aware that this requires advanced knowledge; it is not basic and you can crash your site. If you are not comfortable applying these changes it is highly suggested you contact your web host tech support for assistance. The recommended limit is 300 seconds. You can learn more about this change in the WordPress documentation; Maximum Execution Time Exceeded. You will have to consult your web host tech support documentation or contact them to determine if they provide access to this file. Important, if your host does not support setting PHP environmental values using the .htaccess file, adding this line could cause the server to return an error instead of loading your site. Removing this line will correct the error and allow the site to load. If none of these methods work, please contact your web host support to help you increase the PHP execution limit. How do I hide PHP Warnings and Notices? The purpose of these warning and notices are to help developers debug potential issues with their code. Plugin and theme developers use this information to check for compatibility and that best practices are being adhered to in their code. However, it is considered a best practice to hide these warning and notices on live production sites because they can leak important private information that could be used to compromise your site. To hide these messages you will need to edit your wp-config.php file. Login to your server with any FTP application like FileZilla or Transmit. Or, if you have cPanel as your web host control panel, open the File Manager then navigate to the root folder of your website. Save the file, overwriting the original. Save the file again and overwrite the original. How do I increase the WordPress Memory Limit? You can adjust the memory allocated to PHP on your own, here are some methods to try. I recommend starting at the top an working your way down the list. Apply only one change at a time, do not try to apply them all. The recommended minimum to set the memory limit to is 128MB. You can learn more about this change in the WordPress documentation; Increasing memory allocated to PHP. Important, if your host does not support setting PHP environmental values using the .htaccess file, adding this line could cause the server to return an error instead of loading your site. Removing this line will remove the error. If none of these methods work, please contact your web host support to help you increase the PHP memory allocation. How do I check for a theme conflict? This is temporary and only meant to identify if a there is a potential theme conflict which is causing Connections not to function as expected. Temporarily activate a default theme, such as TwentyThirteen or TwentyFourteen. Check to see if the issue is resolved. If the issue disappears, then you have identified the issue as a theme conflict. If the issue remains, then there may be a bug in Connections. Please report the issue on the support forums. How do I check for a plugin conflict? This is temporary and only meant to identify if a there is a potential plugin conflict which is causing Connections not to function as expected. Temporarily deactivate all other plugins except Connections and any of its extensions and templates. Check to see whether the issue has been resolved or not. If the issue is still occurring, refer to the “How do I check for a theme conflict FAQ?“. After following the steps outlined in the “How do I check for a theme conflict FAQ?” reactivate your plugins. Activate the plugins one at a time and check after each plugin activation to see if the issue is occurring. If the issue is occurring, then you’ve identified the plugin causing the conflict. Deactivate that plugin and then continue activating the remaining plugins one at a time. If the issue is not occurring, continue to activate plugins one at time. How do I manually upgrade? First deactivate and then delete the plug-in from your WordPress installation. Download the latest version of Connections and upload that zip file to your WordPress installation using the built-in upload tool in WordPress 2.7 and newer. Optionally you could unzip the file and FTP the contents to your WordPress plug-in folder. Absolutely! You can switch templates as often as you wish, your entries will be intact. Think of templates for Connections like themes for WordPress. The primary purpose of a WordPress theme is to change the visual style of your site. The primary purpose of Connections’ templates, just like WordPress themes, is to change the visual style of your directory. Just as you can switch themes in WordPress and not loose your pages and posts because they are saved in the WordPress database, you can switch templates in Connections. Here is an example on how to use the Family entry type. Say we have a family, the Doe’s. First, lets start with one of the parent’s, John. Create a new Individual entry for John and put in all his personal info. Second, copy John and change the first name to Jane and add/change any info that relates only to her for example her birthday. Third, do the same for Girl and Boy. Now create a new entry using the Family type. For the Family Name enter something like “Doe, John & Jane” and then click the “Add Relation” button for each member in the family, in this example, four times. In the first column of drop downs select each family member and in the second column of drop downs select their relationships. How do I add a default image? Where do I find the category ID? The category ID can be found on the Connections : Category admin page as shown in this screen capture. Where do I find the entry ID? The entry ID can be found on the Connections : Manage admin page by clicking the ‘Show Details’ link. The entry ID can be found in the rightmost column.